Anyway, this shrimp was near death, usually being motionless, occasionally staggering around and falling on it's back, and then not getting up for a while. I put it in semi-quarantine (i.e. inside a net in the main tank with some plants and a chunk of food nearby) so that the other shrimp won't annoy it and steal its food. But it died after about a day. When I tried to search on this topic, it seems lots of people have berried shrimp die, but not usually right after molting and getting eggs. I also can't see how this is molting related, as this shrimp, and all others have done it several times in this tank. As for my tank, yes there is something sub-optimal about it, as my shrimp aren't as active as the ones I see at the fish store. (They aren't active 100% of the time.) The orange neo was relatively active the last 2 months or so, and quickly gained in size over the other shrimp. But then it started slowing down a bit 3 weeks ago, and I think it was getting over-due for a molt. 3-4 days before the molt, it had eaten a lot, so I wasn't worried about lack of nutrition or anything. BTW, is it possible for a shrimp to be berried with unfertilized eggs? I am not sure if the only other neo in the tank is male or female. other inhabitants: two amano shirmp and one blue neo shrimp, who have also been around for 4 months and are doing fine. I attached a pic of the orange berried shrimp, and also the potential mate. 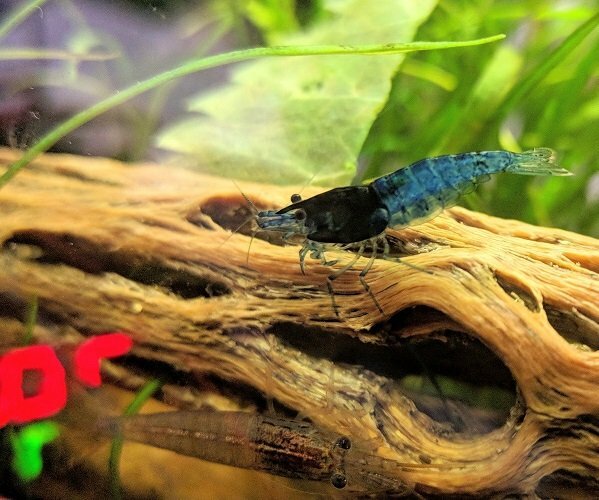 Does the blue shrimp look like a female? 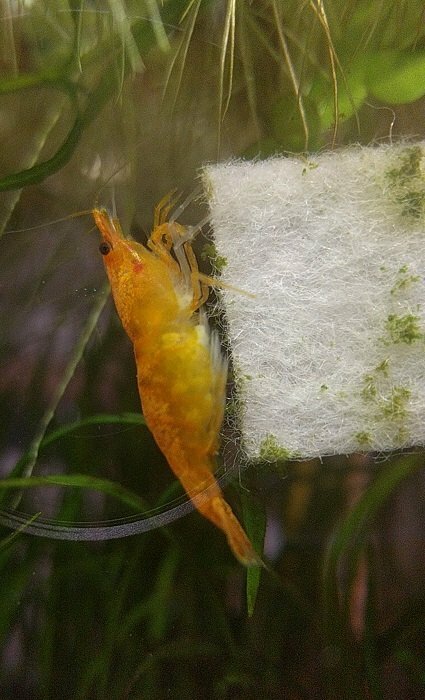 You may be able to save the eggs, JoJo has recently done this (she had the same happen) and I think I attached a yoytube video I saw on setting this up if you have the stuff and want to give it a go, worth it if you only have a few shrimps? I can send another link to the video if you want? The blue one looks like a female to me! Have you lost any shrimps from this tank in the last 3 weeks, maybe (if you have) that was the father? The water parameters look more caridina than neocaridinia, but I don't know whether that may have caused the death? No, there haven't been any other neos in the tank for a while now. I guess that means the eggs are unfertilized and there is no point trying to hatch them. I apologize that i did not see your thread earlier. Ok from what i read, there is no such thing as unfertilized eggs. Meaning when the females are berried all of those are gonna be live hatches. I am so sorry i did not see your thread earlier as i would have encouraged you to give a go at hatching those eggs yourself? It is possible to do that, kind of gross at first but it is possible. I know it is a silly question but do you still have those eggs? For mamas, there are many reasons why they die. I read a first time mama may "drop" her eggs after molting. In this case, you can also save the eggs. I have learnt from the kind people here that taught me, getting a book and changing the exact same water amount every time and gradually lowering or altering the individual values very slowly helps. Than note the date, amount changed, parameters before and after water changes in the book. This helps me take note of what needs to be changed and how to. @sdlTBfanUK simon always reminds me to drip all new water into the tank very slowly. Quick changes to the water kills them pretty fast. Please dont feel too sad as well,@zoidburg did mention once that sometimes the shrimps are already advanced in years when you got them? Sometimes its one of those things? Your parameters i may not be the best to advice you on what is right? But all i can say is keep it stable most importantly? I have a 16litre main tank with crystals and blood marys(neos) my gh is 6 and kh is 0, quite similar to yours? And my ph is 6.3 also with an active substrate. Im still using distilled water remineralized. Will switch to rodi when im back from my trip. Sorry if its a lengthy thread i think i was very longwinded , scroll down to see what to do with the eggs ok? I hope everything works out good for you ok? Thanks for the suggestions. But so far, 4 out of 4 people on the internet said that my only other blue neo shrimp is a female. So I guess that means that if a female carries eggs in her saddle for too long (in this case, maybe 3 months), she will eventually "release" them and then die, or something like that. Oh really? Never did hear somethig like that. Guess its good to learn new things.